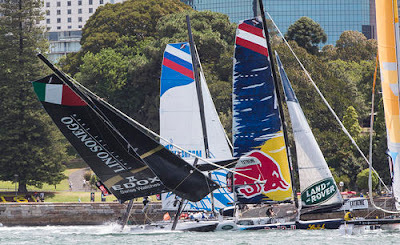 With an ominous wind forecast at the morning race briefing, day two of the Extreme Sailing Series Act 8, Sydney presented by Land Rover didn’t disappoint. Battling punishing gusts of 30-knots that belted through the skyscrapers lining Farm Cove, Lino Sonego Team Italia were caught off-guard by a big gust of wind coming off the Sydney Opera House, resulting in a dramatic capsize in front of the crowds for the Italian team. “As we tacked on the first beat I saw Red Bull Sailing Team out of the corner of my eye, we tried to avoid them but had no space and by then we were already at 90 degrees. That’s when we went in, Enrico (Zennaro) flew past my head as he fell from the tramp, but I was lucky enough to cling on to the boat.” explained bowman Tom Buggy. With no injuries to the crew, the safety team were immediately on site to provide assistance for the team that includes Italians Enrico Zennaro, Nevio Sabadin and Stefano Rizzi as well as French helm and Olympic sailor Pierre Pennec and British sailor Tom Buggy. Remarkably 30 minutes later the Italian team were upright and incredibly shook off the nerves to make it back onto the racecourse for the next race. Not one to shy away from the thrilling conditions, Race Director Phil Lawrence was racing the fleet six boats at a time to allow more space on the compact race track as a safety precaution. Four short sharp races were completed before racing was abandoned for the day. “We continued to race as long as possible but the forecast was for the wind to go further to the south, which meant it would have come straight through the city resulting in vertical gusts which the sailors wouldn’t be able to see. We decided to suspend racing at that point and have a good forecast for tomorrow and even better for Sunday’s final,” reflected Lawrence. Today’s unpredictable conditions have seen a lead change on the podium, with The Wave, Muscat leapfrogging from third to first, tied on points with second placed SAP Extreme Sailing Team. Oman Air are just three points adrift in third. “We haven’t been exceptional, but we haven’t been disastrous either. Today’s gusts were so aggressive you couldn’t really keep in control. It was nerve racking at times and pretty full on. 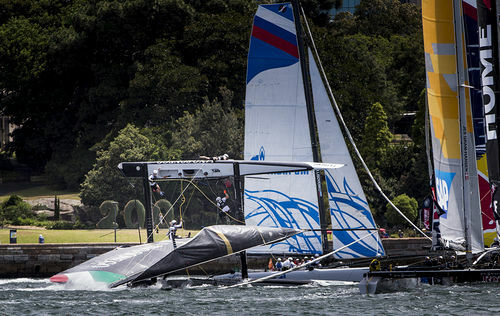 Hopefully conditions get a little more normal tomorrow so we can smash in some good races,” said The Wave, Muscat’s helmsman Leigh McMillan. Leading the mid-fleet charge is Red Bull Sailing Team and Team Turx in fourth and fifth respectively just one point apart. But the performance of the day went to sixth placed Gazprom Team Russia who took their first race win after changing to a full Russian crew in the last Act. 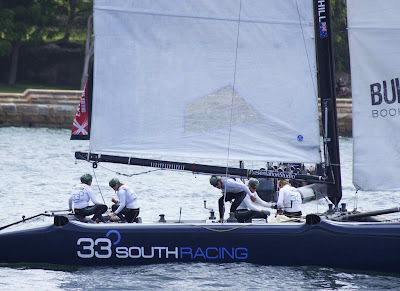 And finally back on the water Australian wild card team 33 South Racing will be raring to go tomorrow after missing a days racing as they repaired a significant hole in the hull of the boat sustained during yesterday’s opening day. 1. The Wave, Muscat (OMA) Leigh McMillan, Sarah Ayton, Pete Greenhalgh, Ed Smyth, Nasser Al Mashari 83 points. 2. SAP Extreme Sailing Team (DEN) Jes Gram-Hansen, Rasmus Køstner, Thierry Douillard, Mads Emil Stephensen, Brad Farrand 83 points. 3. Oman Air (OMA) Stevie Morrison, Nic Asher, Ted Hackney, Ed Powys, Ali Al Balashi 80 points. 4. 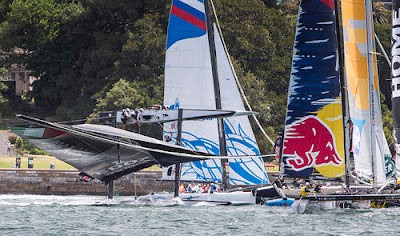 Red Bull Sailing Team (AUT) Roman Hagara, Hans-Peter Steinacher, Lionel Vaucher, Shaun Mason, Stewart Dodson 71 points. 5. Team Turx (TUR) Mitch Booth, Edhem Dirvana, Selim Kakis, Diogo Cayolla, Pedro Andrade 70 points. 6. Gazprom Team Russia (RUS) Igor Lisovenko, Pavel Kalinichev, Pavel Karachi, Alexander Bozhko, Aleksey Kulakov 57 points. 7. GAC Pindar (GBR) Adam Minoprio, Seve Jarvin, Jeremy Lomas, James Wierzbowski, Tyson Lamond 42 points. 8. 33 South Racing (AUS) Katie Spithill, Matthew Chew, Stacey Jackson, Henry Kernot, Luke Payne 41 points. 9. Lino Sonego Team Italia (ITA) Enrico Zennaro, Pierre Pennec, Nevio Sabadin, Stefano Rizzi,Tom Buggy 39 points. Nice Post. Thanks for sharing. But I will share a helpful tips. Dropped Search engines Best position or even Not able to obtaining Very first Pr. Probably the most issue at the rear of this really is replicate content material. Therefore, I'd like in order to recommend a person examine your own material aren't Plagiarized. Examine through Plagiarism Software Will help you much. Must need to see this.